Cape York Forums - Questions and Tips. If you have a question about anything in Cape York, or have a tip to share with other travellers, please write it below. (You can also read, and comment on previously asked questions and answers below the form). I will answer the questions almost immediately, at least, usually on the same day. NB! To make sure that you get an answer, please make sure that you let me know about your email address (I get it if you tick the box for notifications and put your address in). I will not publish it, I am only asking because without it, I cannot get back to you and answer your question in case it did not go up on this page (for different reasons such as same questions that come up too often). Alternatively, you can always ask via the Contact Us page - that is particularly recommended if you have any questions about the Destination Guide. Have a Question or an Experience to Share? Do you have a question before your Cape York trip, or an experience to share after? Or maybe a tip to other travellers? Share it! Heading to weipa last week of april, how are the roads looking at present. Can I go yet ? Where can I buy your 300 page version..
Caravan or Not - to Cape York? Hi, Planning trip for July 2018, free camping, is drinking water freely available enroute, or is running creeks and rivers ok for drinking?? I recently read that access to Vrilya Point is now gated off, does this imply it will be permanent? It has been a great place to visit. Is vrylia point bridge open?? How long does it take to drive Archer River to Bamaga? How to get the Destination Guide 2017 when i already have the 2016? Road Condition from Port Douglas to Weipa Anyone? Can any one please advise us the road condition from Pt Douglas, Palm river roadhouse, Coen, to Weipa? Until where is the road sealed? is the road sealed from port douglas --palmer river road house - coen - to weipa ? Has anybody travelled to Cape York in the last month? If we can't get through palm creek with camper trailer is there a bypass track around it. Seems a shame to miss so much because of one crossing. 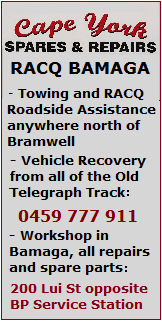 Can an off road caravan be towed to the Cape by avoiding the Telegraph Road? Whast is the furtherest you can go in a awd vehicle? Is there anyway to get to the tip? Trailer Hire - Secure parking area. G'day Katrin. Can I take my dog along the Bamage bypass road to the Tip? Or is the OTL the only way up ? Many thanks Tony.. Going 1st week OCT..
G'day, I was wondering if the complete Destination Guide has any information about the WWII sites (locations/maps)? Thanks. I know they are doing bridge works on the creb near China camp, but can I go halway up and test out my new 4x4? Do you need a boat to fish the cape? Are there day tours to the tip of Cape York from Bamaga or Seisia in July next year?? Car freight from Brisbane to Cairns or Townsville? Do many people do the cape trip in caravans? I heard today Gunshot Crossing was closed late 2013 & talk of the OTL closure altogether, any truth? Cape York with Jayco Outback? Up the western coast of Cape York? Old telegraph track, how long does it take? Going up Cape York from the western coast? 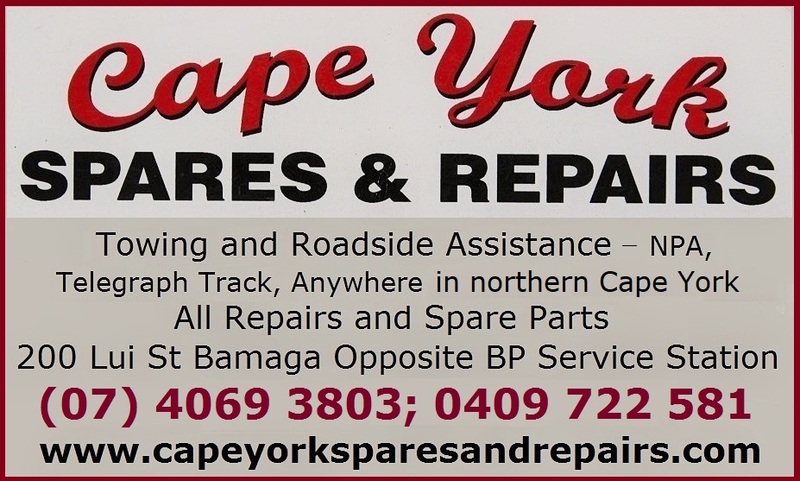 What is your advice going up Cape York from the western coast? Bloomfield Track with a camper? How Long Time for Doing Cape York? One month enough to do Cape York? Clothing for the Trip and Snake / Spider Protection? NB! If you sent a question and do not find it published here, please contact me again via the 'contact' page with your question. Not all questions are suitable for publishing here (for different reasons, not because you had a stupid question). If your question was not suitable and you did not give me your email address (even by wanting notifications), then I have no way to get back to you so please get in touch.